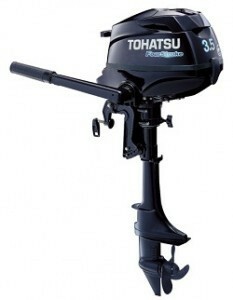 In the world of petrol outboards, we sell portable motors made by Suzuki and Tohatsu. Picking and choosing between the two ranges you can get access to the best model in each size. 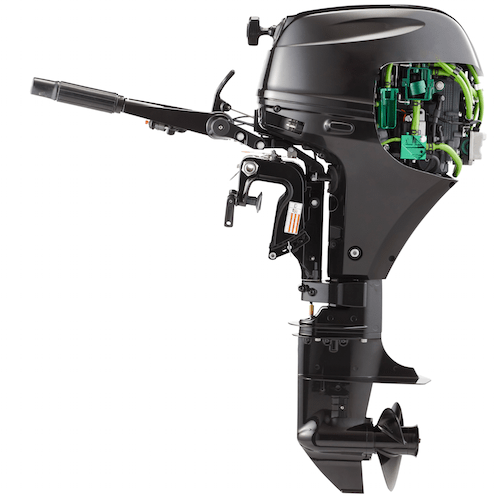 It’s worth noting that in the sizes we sell (up to about 30hp) Mercury and Mariner branded outboards are in fact mechanically identical to Tohatsu – because Tohatsu make all three in their high-tech factory in Japan. We have also mentioned in the text a few other models you might consider (but that we don’t sell). The motors are listed in ascending power order, ie bigger engines are towards the bottom of the page. Prices are for the most basic (manual start, tiller control) version, but we are happy to supply other models – with electric start, remote control etc – please call. 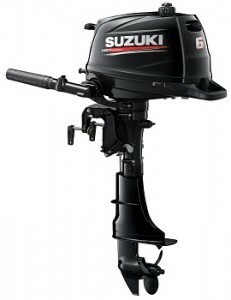 Suzuki make marine engines from scratch, and the benefits really show in their 2.5 model: at 13kg it’s the lightest water-cooled 4-stroke outboard on the market, by about 5kg. It also has a proper F-N gearbox, not a centrifugal clutch, so you can rev it up without being catapulted out of the dinghy when it starts! Motor Boats Monthly rated the Suzuki 2.5hp “Best Buy”. The nearest rival for weight is the Honda 2.3, but it’s air-cooled (which makes it rather noisy to our ears) with a centrifugal clutch, which “takes some getting used to”. We like Honda products in general, but not this one. Other motors labelled 2.5 are mostly a de-tuned 3.5 and weigh 18kg or more. At this end of the size range (up to 4hp or so) it’s also worth considering the Torqeedo 1003 electric motor, or close rival the Epropulsion Spirit, both of which are more expensive but to our mind have several advantages that outweigh the purchase price. Next size up is the Tohatsu 3.5, also available badged Mercury or Mariner. You can also buy the same motor de-tuned to 2.5hp but as there is very little difference in price and they’re the same weight, there doesn’t seem much point. These motors weigh about 18kg so are still easily portable. They are water-cooled with a proper F-N gearbox, look great, and are very nicely made. It’s a properly-engineered small engine, made in a modern factory in Japan (ie not one of the many questionable Yamaha knock-offs made in China, which aren’t actually much cheaper). We don’t have enough evidence for this to be statistically valid, but in our hands it also seems less prone to “carburettor gumming” than some other small motors we’ve experienced. Price for the Tohatsu 3.5 is £648. The Long shaft version is £10 extra. Above 3.5hp nearly every manufacturer – Tohatsu, Mercury, Mariner, Yamaha etc – seems to offer a 6hp motor that can also be had as a 4 or 5, all at approx 26kg in weight. We don’t see much point in having the weight without the power so would always go for a 6. The one that stands out is the Suzuki 6, which is only 23.5kg (10% lighter than everyone else), and can be laid down on three sides. This new Suzuki 6 has a proper oil pump and filter (rather than most rivals’ splash lubrication), with other new features making it a quieter, smoother, and easier to start, too. We think it’s the clear leader in its class, RRP Suzuki DF6 £1190. The Tohatsu 6 at £972 is a useful chunk cheaper if you can live with a bit more weight and slightly more noise at full power. And like their 3.5, is very well-engineered and well-proven. Above 6hp most manufacturers offer a 9.8 or 9.9hp motor with the option to have exactly the same thing de-tuned to 8hp. At this size all are two cylinders, making them much smoother and quieter than “single pots” (all 6hp and below), but also significantly heavier. If you and your boat can take the weight then an 8 or 9.8 will be more pleasant to use, and of course faster. 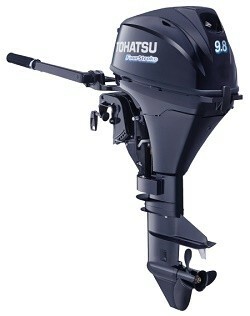 The Tohatsu 9.8 is the motor of choice here, as at 37kg it’s about 3kg lighter than the Suzuki, and a bit cheaper. It’s a really nice piece of kit, and customers are amazed at how little noise it makes. Our picture is correct, ie has the 2016-onward cowling (which was changed in shape to help make it quieter) and decals. 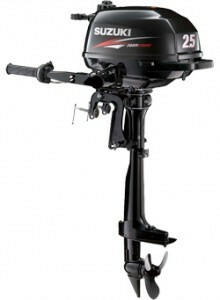 Last of what we consider to be portable outboard motors is the 15 & 20hp group. In this market until very recently Suzuki was the runaway leader, as at 44kg their 15/20 was 8kg lighter than the nearest rival. And – uniquely – it has EFI (Electronic Fuel Injection) for easier starting (no choke etc), faster pick-up and better fuel economy. Yes, that’s double the power for only a 19% increase (7kg) in weight, compared with the (lightest-in-class) Tohatsu 9.8! The new model Tohatsu 20 price is £2640. NB if you find a Tohatsu 20 listed cheaper, it may be the previous version – this was a very nice engine but does not have EFI and weighs 52kg. If you were thinking about a 10hp motor the Suzuki 15 at £2445 may also be worth consideration. It has no weight advantage over the 20, but some boats have a 15hp limit, and with this motor you still get EFI and a motor that only weighs 44kg. The same logic of course applies to the new model Tohatsu 15, which we can do at £2160. The prices above are for the basic (manual start, tiller control) set-up.